AL-BADEE‘ is derived from the Arabic word bada‘awhich means to innovate and originate in an unprecedented way. Allah, Praise and Glory be to Him, is the Great INNOVATOR; He innovated the heavens and the earth as He originated and created them in an unprecedented way, He says, “To Him is due the primal origin of the heavens and theearth; how can He have a son when He hath no consort?” (AN‘AM, 101). 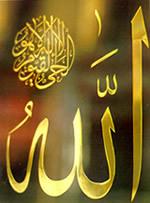 Allah is the only Innovator Whohad been existing before everything’s existence, “He is the First”(HADID, 3). Allah innovated and perfected the forms of His created beings in an unprecedented way, nothing ever equals His Exalted Self, His Attributes or His Deeds; He is the Originator, eternally and permanently, Glorybe to the Great INNOVATOR Who innovated all created things, and revealedthe marvels of His Creation, Praise and Glory be to Him, He is Allah.